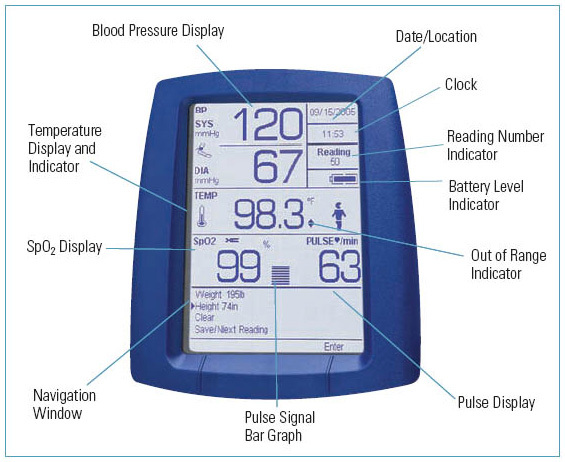 SureBP technology measures blood pressure in about 15 seconds as the cuff is inflating resulting in time savings for you and improved comfort for your patients, pulse rate and MAP included. Choice of SureTemp Plus or Braun ThermoScan PRO 4000 ear thermometer. Choice of Masimo or Nellcor pulse oximetry. Ability to manually enter weight, height, respiration rate, and pain level; calculates Body Mass Index. Connects to select Healthometer digital scales. Click here for the Health O Meter Scales. 50-reading memory allows retrieval of previous data for review, to print or to download later. Error messages give you descriptions and real solutionsnot just error codes. Bigger, brighter LCD display provides greater visibility from farther distances. 2-year warranty on vital sign device. 1-year warranty on SureTemp probe.